The US economy is slowing. Things might get exciting if this continues. Summary: In an this time of almost unprecedented economic intervention by governments — experiments on a scale never before attempted during peacetime — determining the state of the economy is difficult. Determining the near future of the economic is almost impossible. 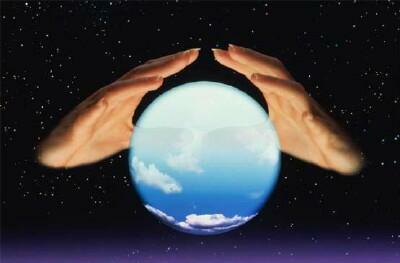 Determining the distant future requires psychic powers. Today we continue our series of looking at the data and guessing about the future. Accurate economic forecasting is difficult. What happens if the US slides into a recession? The US economy is large, complex, and rapidly changing. Economic theory is immature. Our economic data collection agencies are grossly underfunded. The combination makes accurate forecasts almost impossible, especially detecting inflection points. Even economists find it difficult, proven by the record shown by surveys of economists. The best known are the Blue Chip Financial Forecasts and the Wall Street Journal’s Economic Forecasting Survey (available to non-subscribers here). Neither has ever forecast a recession. We are in trouble if the theory about a “stall speed” is correct — that slowing below roughly 2% increases the odds of a recession. On the other hand, forecasts for second half and 2014 GDP are not being cut, so the gap between first half and second half GDP is widening fast — reflecting confidence about the transient effects of higher taxes, the sequester, higher oil prices, and higher interest rates. Also confidence that consumer spending and business investment will accelerate in the second half of 2013. And, above all, confidence about the wealth effects supposedly created by QE3 (more on this on another day). In May there were many forecasts for 4% GDP growth in 2015. Now the consensus forecast is 3.0%. Hopes for a boom have dimmed, or been pushed into the future. (3) What happens if the US slides into a recession? It’s a question few economists wish to discuss. Some cyclical areas remain so weak that they should not fall far (eg, housing). But many industries and regions remain weak, as does the world economy, suggesting the possibility of a severe downturn. As for the government’s response — Another round of monetary stimulus would take us further into uncharted terrain. Fiscal stimulus would undo the work done to reduce the deficit, and might prove politically contentious. A recession could get interesting. The US economy is $16 trillion component of a $72 trillion world. It seldom rolls over quickly, except from an external shock (e.g., the 1973 oil embargo). No such shock seems likely now. On the other hand, we might be in a recession now and not know it (for the reasons listed in section one above). In a recession GDP typically declines by roughly 2% per year. We can no more detect that by our personal experience than we can sense a slow 2% change in the air temperature. Most economic changes are visible only in the macroeconomic data. 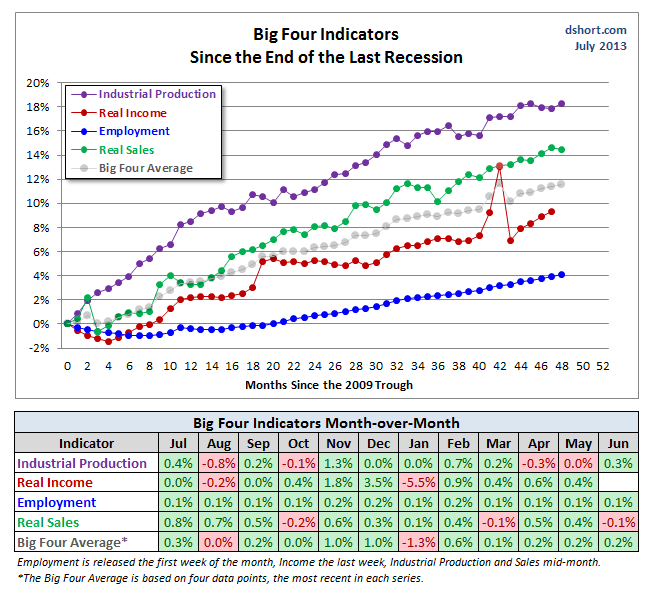 As this graph of the “big four” indicators shows, today the economy looks OK (source here). (5) What is a recession? A recession is a significant decline in economic activity spread across the economy, lasting more than a few months, normally visible in real GDP, real income, employment, industrial production, and wholesale-retail sales. … Most of the recessions identified by our procedures do consist of two or more quarters of declining real GDP, but not all of them. … Our procedure differs from the two-quarter rule in a number of ways. First, we consider the depth as well as the duration of the decline in economic activity. Recall that our definition includes the phrase, “a significant decline in economic activity.” Second, we use a broader array of indicators than just real GDP. One reason for this is that the GDP data are subject to considerable revision. Third, we use monthly indicators to arrive at a monthly chronology. 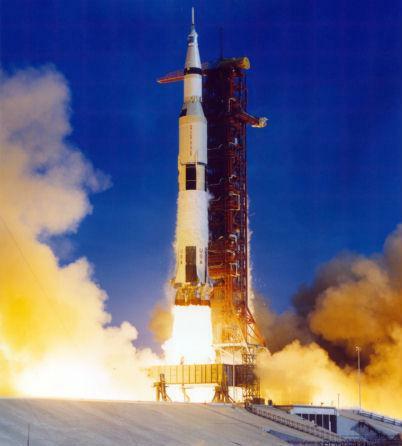 Launch time for the economy? Previous Post Let’s watch the oceans die while we worry about other things! The quote “It’s hard to make predictions, especially about the future” has been variously attributed to Yogi Berra, Samuel Goldwyn and Neils Bohr. Should I assert that if one were to goto the top of a certain mountain in Turkey, he would be able to dig up Noah’s Ark, then I would be making a prediction about the past. Should I make a similar assertion about King Solomon’s Mines, then it might have economic significance. I hate to say this, but I don’t get it. Can you explain for us humor- and irony-deprived folk? Also, I have serious questions about those graphs. The blue line purports to show employment. Yet this graph of the employment-to-population ratio shows an opposite trend. Is the definition of “employment” here the inverse of official unemployment, i.e., the number of people who report they’re out of work and looking for a job? If so, it’s a garbage number, because the stats show clearly that people out of work for a long time stop looking for work and thus drop out of the “official” U6 or U4 unemployment statistics. But they’re still unemployed, they’ve just gone back to live with their parents or in a cardboard box under an overpass, and they’re no longer looking for work because they’ve given up. Also, the spike in the real income stats at 41 months looks to my eyes like a glitch. Perhaps something seasonal, or some error in data collection. These aren’t smoothed data, are they? What do the data look like with a moving average applied? I think that would give a more realistic picture. Also — what does industrial production look like ex weapon manufacturing? Much lower, I’d guess. I have a strong hunch that much of America’s durable goods production today is funneled into building useless aircraft carriers and worthless ICBM-carrying nuclear submarines and other worthless gewgaws for America’s terror-industrial post-9/11-panic security industry, rather than durable goods that add a knock-on effect to grow the economy, like an industrial refrigerator that gets sold to a restaurant which in turn hires people who spend their wages to increase aggregate demand, which creates a feed-forward effect in the economy. As opposed to a cruise missile that just gets shot at a wedding party in Pakistan and creates no knock-on effect to boost the U.S. economy and no addition to aggregate demand. Moreover, this chart of durable goods production (originally published in the New York Times, from FRED data unless I’m mistaken) tends to bear out my thesis on industrial production. The graph shows employment. The employment to population graph compares employment to another factor (population). There is no reason these two graphs should look like one another. That people like to devise new definitions for common terms (ie, “employment” as the ratio of jobs to population) is one reason discussions of economics so frequently descend into cacophony. Economics is complex. Like an elephant, it requires seeing from many perspectives. In the For More Information section you’ll see a more detailed analysis of the jobs picture — looking at the trend in different ways. Yes, economic data series often have weird data points. Which is why they are usually shown as a trendline. Watch the trend, don’t get hung up on individual datapoints. The underlying reports discuss these; but they are seldom significant in terms of understanding the broad picture. The economy is what it is. Discussing what it should be — too much or too little defense spending — is an entirely different subject. Macroeconomic metrics — GDP, industrial production — do not make value judgements about the nature of the economic activity (this is a goal; like all goals it can only be approached but not attained in practice). * 3.5% of total durable goods. Not “much” by my standards. Broadly speaking, “defense” (including pensions, intel, USCG, nuke weapons work at DoE) is roughly less than one trillion of the $15+ T US gdp (many estimates are around $800B). That’s aprox 6%. More than Defense share of US mfg, because so much of Defense spending is on people. A different, probably more interesting perspective, is to look at the proportion of goods and services that are tradable. Take out all the ICBM, McMansions, hairdressers, hamburger stands, warders and DHS guards, etc, etc, and see what remains that could be sold to or exchanged with other countries. Why are tradable goods so important? Also, exports are one of the great success stories of the US economy for several generations, as exports have grown as a faction of GDP. That the proponents of faux-economics have persuaded so many people that the exact opposite is true is a tribute to the gullibility of modern Americans. Tradable goods and services constitute all of the exports, and therefore indicate the capacity to export. They are therefore a major adjustment variable in a macro-economic setting. Furthermore, since tradable goods and services are intrinsically confronting competition, the economic sectors producing them are those that will largely determine the (combined) productivity (of labor and capital) of the economy — which itself is determinant for the rise of income that can be redistributed to economic agents. Notice that the US manufacturing sector, which, as you mention, exports a lot, is very productive (but represents a small minority of the entire economy); the service sector experiences a dismal productivity overall — except for those few sectors that are tradable (e.g. Internet firms). “Also, exports are one of the great success stories of the US economy for several generations, as exports have grown as a faction of GDP. While this is true, it is just an isolated economic measure: it is also important to determine whether the capacity to export (i.e. the proportion of tradable goods and services) has increased or not, and whether exports are pushed to the detriment of the home demand (artificially stunted as in China, or stagnating because of structural austerity reforms and the demographic evolution). Did I suggest what you denounce? Certainly not. I apologize if what I said implied that. But when talking about tradable goods, it is highly relevant to mention that exports are a BIG success story of America in recent generations. The truth is that there was no recovery, there was only a halted decline. Why is the 2% growth said to be on the edge of the recession, or increases the likelihood of the recession? Because that is the population growth, and if the economic growth is at population growth levels, then it means that there is no growth that will benefit population. In adition to that as it is known that 1% increasing their shaare of the growth, that would mean the decline in benefits to the population as a whole. GDP growth is a number that is supposed to show and to represent growing prosperity of the population. That is why we are looking at GDP, it is a quantifiable way to look for indications of prosperity. Once you start looking at the number by itself forgeting about why we started to look at it in the first place then it is only technical indicator without purpose. The economy is supposed to be about growing prosperity of the populace, not for some inter-national competition where we cheer our team’s score presented as GDP. That is what GDP became in economists minds and in yours too FM. Official unemployment is a combination of a survey and paychecks count and it can not be perfect, but considering what is the purpose of taking the count and having it at display then hiding the alarming numbers defeats its original purpose to know when to take actions to ameliorate suffering of the populace. AT the present, they use improving official numbers to hide inaction behind. That is so wrong and it shows why economists do not get it still after so much experience and studies. Micro is simple and solved, macro is simple but there is so much deceit involved to make it complex. Three rules to follow in fiat money system and you can know it all about macro that needs knowing. 1. One’s spending is someone else’s income. 2. Money does not cross borders except in our pockets. I assume you are a billionaire from your investments based on your awesome economic predictions. Start a website and share them with the rest of us. Don’t be satisfied with fortune; go for fame as well. Back in the real world — economics, like all the social sciences, are both complex and as yet poorly understood (i.e., immature). Accurate forecasting (ie. a process, not a single guess) lies beyond the current state of the art. Other factors — underfunded information collection agencies monitoring a large changing nation & world — make this goal even more difficult to attain. This makes macroeconomic management fantastically difficult. But then leadership and management are inherently difficult. I’ve only run small groups, and I have grey hair. False, by a large number of metrics. Nope. Follow the link to the Fed study. And you say that why? That is one very strange assertion. I say that GDP in itself, by itself does not say how that wealth is distributed. If the GDP has grown but all growth went to the 1% ( as was the case for the last 30 years) then the populace has lost in living standards and very important is the perception on their prosperity since populace can see the growing disparity between them and 1%. In short, GDP does not show inequality growth. Distribution of GDP is what matters a lot, accounting trough money distribution is the way goods and services are distributed. So, if you want to understand economics, look at how money flow works, not how goods and services flow since they only follow the distribution of money. Most of the economics theories are centered on goods and services flow, not on money flow. If it is centered around money flow, then most of the people would understand central role the Congress has in directing the economy. They could see such central planing as to blame for their personal economic decline, not some imaginary market forces, invisible hand, or some other made up theories that tells them that it is their fault for unemployment, that it is only their own failing, not the system that has failed (even tough that understanding is becoming more common as time goes by). Central planing of an economy in US is done primarely trough tax and subsidy system which takes time to affect change, not as in former soviet block which was doing it trough decree and change happens in short period causing perceptive reactions in populace. Every change in the system has beneficiaries and losers, give them the time to adapt and there is less of an reaction to change. Talking about predictions on economy is impossible since you can not know what Congress will do in next year that would drasticaly change the economy. Such variable is hard to predict while the economic side is easy. If the Congress decides to bring back 94% marginal tax and $15 minimum wage and unlimited resources to the service sector from financial sector, the Great Recession would be over in two years. It is that simple. To add some caveat, military production could be switched to civilian production just as it did switch back and forth many times in history- no need to import from China. Lets look at the chart in your post. Look at the employment levels and industrial production. Employment is stagnating while production is rising fast. That is the effect of robotization. It does not matter if that is military or civilian production, but lets say that Congress decides to make it all for civilian needs. It could produce much much more with much fewer employees then at the present and satisfy all the needs of the population. You could have about 10% of presently employed producing all what the whole society needs with proper distribution of such goods and services using smart money distribution as an accounting way to achieve that. I do not agree with most of this. An easy first test of your theory is to make it more specific. (1) Put numbers on it. How much of US GDP is changed by Congress each two-year term? Over each decade? You might be surprised how small the number is. (2) In what sense does the US have “central planning”? It’s a range, not a binary condition (you have it or you don’t. (3) In what sense can you show that it “has not worked”? It’s these things that distinguish a theory from a rant. I suggest reading more about economics. You appear to have near-zero knowledge of what economists are saying or doing. These things are actively studied by people with knowledge and skill. You might find what they say of interest. As for investment advice, follow margin debt (money printing) to know trends in Wall Street in total. After that there is only money jumping from one sector to another, money jumping from money market to stocks sector, money jumping from precious metals to energy, or to FX, that is affected by rumors among traders and you have to be a trader to know rumors. That is not such a strange assertion, FM. You simply do not agree with it. “Economics” as a branch of philosophy was at one time exactly about the populace; that was before your time. Predictably the American experiment has hit a few more bumps in the road than many of you old guys wish to acknowledge. It just ain’t the Place youse guys think it ever was/is. Oh and this blaming the Citizen meme just doesn’t fit anywhere in History, now does it? Oh well. It is something to talk about instead of Katy Perry or that bright light Ms. Kardashian. Didn’t her dad get OJ off? That assertion is is FALSE with respect to me, since I do not believe it. 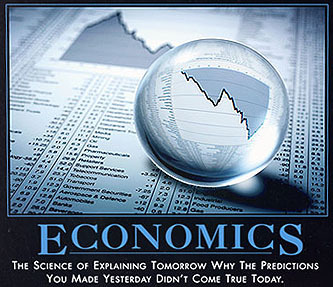 I believe it is FALSE about “economists’ minds”. I am widely read in economics, as a layman, and personally know several. I have never seen or heard any say such a thing. No surprise, since it is a daft belief. As usual, he gives no evidence. By calling it “a strange assertion”, I was being charitable. That is a common statement in these comments, and I see no better illustration why reform in America has proven so difficult to do. Citizenship is about assuming responsibility for the State. That is the engine that puts people into motion. Consumers whining “it’s not my fault” are inherently subjects. They have as much influence on the State as they do on the Sunday morning football games. Considerable but indirect, and zero with respect to the fact that these are run for other’s profit. Possibly, the path is charted — by Japan. A second dip now, would make our experience a neat echo of Japan’s lost decade. The timing would be perfect — about 5 years since 2008. They also tried to reduce deficits and raised taxes and cut back spending part way through. It didn’t go well. Of course the Japanese plunge was dramatic and immediate, and we haven’t had that yet. What does match with both countries is that the political common sense here has a similar vibe as it did in Japan. Everyone knew those deficits were bad, everyone knew that taxes should be raised and spending should be cutback. It just made good intuitive sense — that is until they actual tried it. Maybe, when a fundamental change like QE comes around, it’s a weird new world, and this confounds conventional experience. There’s a unstoppable desire to go back to the past when things were right — even if there’s no going back. This might be a lesson we have to learn the hard way. Yes, we might be following Japan’s path. That was the fear in 2008, offset by our keen awareness of our superiority. Now, after five years of stimulus-boosted slow growth, that fear remains in the shadows. Some economists are increasing their Q3 forecasts, most often assuming higher rates of non-residential investment based on the Philadelphia Fed report.